Even Wall Street thinks this truck maker, drug company, and offshore driller are too risky. Wall Street is in love with the stock market. According to an analysis by the Bespoke Investment Group, of the 12,122 analyst ratings on companies in the S&P 500, nearly 49% were rated as buys. On the other hand, less than 7% were rated sell, or something similar, with the rest rated a hold. Given that Wall Street rarely hates a stock enough to believe it will drop in value, when it does, investors should take notice. Here are three hated stocks that certainly caught our attention. Neha Chamaria: You wouldn't really call a stock that's up double-digits so far this year a hated one, but Navistar International's (NYSE:NAV) recent run-up gives you only half of the picture. The truck maker stock is down 64% in two years, with 14% of it sold short. That isn't too alarming, right? Wait: Navistar's float short percentage, or the percentage of outstanding shares sold short, excluding those held by insiders, stands at a whopping 70% today. That's an important number as nearly 30% of Navistar shares are held by insiders. In simpler words, the majority of general investors are bearish on the truck giant. So, why doesn't the market like Navistar? It's a loss-making company, to begin with. But from nearly $3 billion in losses in 2012, Navistar cut down its net losses to only about $184 million in 2015 as it fought hard to settle warranty claims while restructuring operations. However, the real breakthrough, if I may call it that, came in Navistar's most recent quarter, when it reported its first quarterly profit -- albeit small -- in nearly four years. That sent the stock surging, but on the flip side, the truck maker downgraded its full-year guidance on deteriorating North American trucking markets. That gave investors a good enough reason to continue to hate a cash-flow-negative, debt-laden company. Of course, another couple of profitable quarters and Navistar could be a solid turnaround play. Still, at this point, it's only prudent to watch the stock closely instead of diving in, because short-sellers may not be entirely wrong with this one. George Budwell: Wall Street is extremely divided over clinical-stage biotech Sarepta Therapeutics (NASDAQ:SRPT). On one hand, if the FDA approves the company's experimental Duchenne muscular dystrophy, or DMD, drug eteplirsen, the biotech's broader pipeline of DMD drugs is arguably worth billions in future sales. Unfortunately, eteplirsen's approval now hangs in the balance after the agency requested additional data on the drug's ability to restore dystrophin levels -- the key protein that's largely absent in DMD patients -- from an ongoing confirmatory study. And if the FDA doesn't back the company's assertion regarding eteplirsen's efficacy, Sarepta's stock may have a tough time finding a bottom, given that its valuation is based almost exclusively on its DMD platform. According to the latest figures, shorts are now in control of more than 19 million shares of Sareptamaking it one of the most shorted stocks (as a percentage of the float) listed on a major exchange in the United States. While such a bearish bet is hard to go against, I'm cautiously optimistic that Sarepta will eek out an approval in the next few months, potentially setting this stock up for a short squeeze for the ages. That said, I personally wouldn't risk it, as the downside is simply too steep if the shorts turn out to be correct. Matt DiLallo: Earlier this month, analysts at Seaport Global downgraded offshore driller Transocean (NYSE:RIG) to sell and slashed their price target to $10 per share. Seaport cited a valuation that "seems stretched" because the offshore rig market is not improving because of persistently low oil prices. Further, analysts were worried about Transocean's balance sheet after a poorly received debt offering. Seaport is not alone in its disdain for Transocean. Of the 37 analysts who cover the stock, seven rate it a sell, 14 rate it underperform, and another 13 give it a tepid hold. 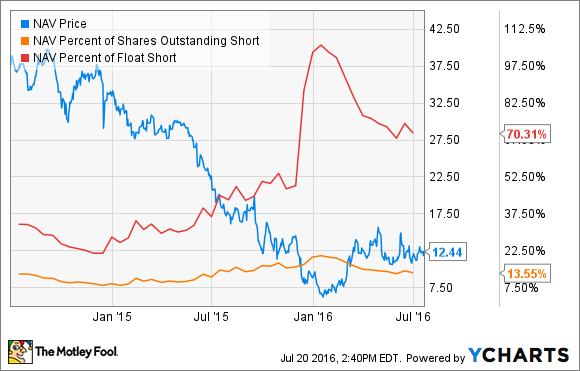 Meanwhile, it is the second most heavily shorted stock in the offshore drilling sector, with 28% of its float sold short. In fact, traders increased their short bet over the past month by nearly 1 million shares, bringing the total shares sold short up to a whopping 90.9 million. Wall Street hates Transocean because of the abysmal offshore drilling market. There just isn't enough work to go around, which caused Transocean and others to retire and idle a boatload of rigs. Because of this, competition is fierce for the few contracts going out for bid. For example, Transocean recently outbid its rivals for an offshore drilling project in India. However, it only bid a $127,000 dayrate for the 730-day contract, which was well below the $175,000 dayrate analysts expected this rig could fetch. That contract suggests Transocean does not see any improvement in the market on the horizon. Wall Street, likewise, doesn't see the offshore drilling sector improving anytime soon. Because of that, it expects Transocean's earnings to continue to decline as legacy contracts roll off, and it either accepts significant dayrate reductions on new contracts or takes additional rigs off the market. The steady earnings decline will likely keep the pressure on its stock price until there is a noticeable improvement in the sector's outlook. Given this outlook, now is not the time to swim against the current by wading into the offshore drilling sector and going long Transocean's stock.